The Kaikoura Peninsula on the South Island of New Zealand is a great spot to view a Pied Shag. The Pied Shag resides mainly around the coastal areas and breeds in and around the Kaikoura Peninsula in New Zealand. 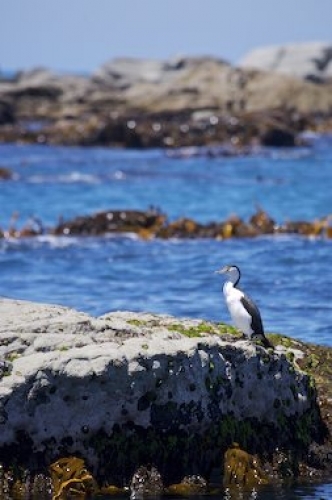 The Kaikoura Peninsula on the South Island is one of the best places in New Zealand to spot a Pied Shag as they usually do not travel more than a kilometer or so off the shoreline. This large black and white colored bird has quite a fair sized beak being hooked at the end and a tail in the shape of a wedge. Their necks are fairly long which helps them feed on fish like mullets, flounders and crabs which they trap in the shallow waters around the rocks. The Pied Shag is a protected type of bird and is increasing in numbers every day along the Kaikoura Peninsula on the South Island of New Zealand. The Pied Shag is often seen on top of rocks in the Kaikoura Peninsula where they stand tall and dry their wings after swimming around the shallow coastal waters. Kaikoura Peninsula in New Zealand is a fascinating place to visit where a picnic can be enjoyed as you explore the amazing world of the coastal life of New Zealand. Pied Shag, Phalacrocorax varius varius, near the Seal Colony on the Kaikoura Peninsula, Kaikoura, East Coast, South Island, New Zealand.